Tulsa, Okla. (May 24, 2017)— From the Techno and House dance parties of the backyards and warehouses of East Los Angeles to the border refugia of El Paso to the ancient storytelling strong enough to survive the Rio Grande crossings, Chicano thrives on community. In Papel Chicano Dos: Works on Paper from the Collection of Cheech Marin, Philbrook Museum of Art presents works by 26 artists, assembled exclusively from the Chicano art collection of actor-comedian Cheech Marin. While the pieces are linked by the common theme of community, they illuminate the diversity of the Chicano experience through unique artistic practices and viewpoints. The exhibition opens June 4 at Philbrook Museum of Art, 2727 S. Rockford Road, in Tulsa. Marin, who with Tommy Chong formed the legendary 1970s comedy duo Cheech & Chong, is among the foremost collectors of Chicano art in the world. Chicano (or the female Chicana) is a term used to define a person of Mexican-American ancestry, typically of Southwest descent. But Chicano is also a cultural, ethnic and community identity. The drawings, prints, and paintings on paper represent a wide range of emerging and established artists from the 1980s to present day and feature images influenced by pre-Hispanic symbols, post-revolutionary nationalistic Mexican motifs, and contemporary urban culture. The images explode with color, and celebrate the richness of Chicano life, and the mystical side where life seeps over into death. Many artists in the exhibition present social issues concerning labor, political liberation, and spirituality in ways that combine the images iconic to Chicano art with those from a wider range of historical sources. These visuals combine to create a multifaceted view of Chicano communities and shed light on the issues and triumphs facing all American communities. 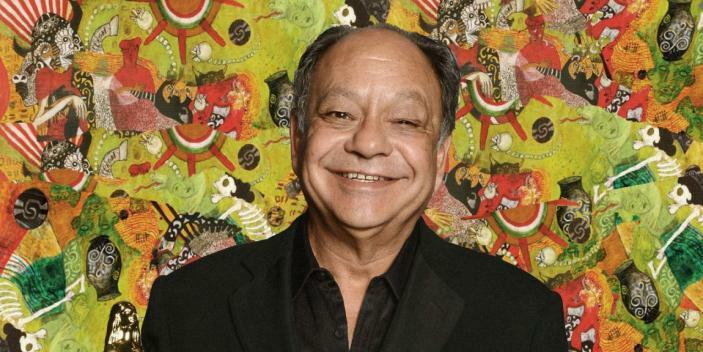 In conjunction with the exhibition, Philbrook will host “An Evening with Cheech Marin,” 6 p.m. June 22, in the Patti Johnson Wilson Hall at Philbrook. Marin will discuss his collection, his career as a Chicano actor, director, comedian, author and musician, sign hardcover copies of his new memoir, Cheech Is Not My Real Name: … But Don’t Call Me Chong. Tickets are $30-$35, available online at my.philbrook.org. Philbrook Museum of Art, 2727 S. Rockford Road, Tulsa, Okla.
Press preview: 10 a.m.-noon June 1, 2017, 10 a.m.
Philbrook Museum of Art is open 10 a.m.-5 p.m. Tuesday through Sunday, and 10 a.m.-8 p.m. Thursday, Philbrook Downtown, 116 E. M.B. Brady St., is open 11 a.m.-6 p.m. Wednesday through Saturday, and noon-5 p.m. Sunday. Museum admission runs $9 for adults, $7 for seniors and university students; Philbrook members and youth 17 and younger are always free.